This book, the fourth in a series dedicated to WW2 RAF Squadrons, describes the war fought by 501 (County of Gloucester) Squadron. It comprises 140 pages packed full of information. The Gallic publisher’s logic includes the front & rear covers in this total ! Pages 4 to 47 present the Squadron’s wartime operational history. The activities of the squadron during WW2 are described in considerable detail. From the squadron’s incorporation into Fighter Command on 1st December 1938, and its being equipped with Hurricanes – through to disbandment on 20th April 1945, its participation in hostilities is presented chronologically and with those days which witnessed aerial combats or other events of note being described in detail. The eve and outbreak of the war, followed by the Phoney War period leading to the Squadron’s deployment to France on 10th May 1940 are captured succinctly. Several pages then recount in minute detail the combats and movements of the squadron during the hectic Battle of France up to its evacuation back to the UK on 20th June 1940. The Battle of Britain follows with a dozen pages crammed with dogfights, baleouts, crash-landings, victories and losses - the authors are to be congratulated in presenting such a wealth of information in a clear but well paced sequence – permitting the reader to “be there” at every scramble. After a brief flirtation with night fighting in early 1941, then re-equipping with Spitfires in spring of 1941 ; the FW190 interceptions and all the offensive operations with which 501 was tasked from early 1941 right up to D-Day in 1944 are described in their essence. Notable operations and combats receive greater attention but as with the previous campaigns, here too the authors include all changes of station, and pertinent personnel movements (postings and promotions / losses) within the period, for the benefit of the reader. A brief return to France in June 1944 – covering the Normandy beachead lasted for only a fortnight, this period is also well covered ; the Squadron then went back to the UK, to at first cover Channel convoys and undertaking some operational sweeps. From mid-summer 1944 – with Tempests replacing Spitfires, 501 Sqdn. became one of the ADGB squadrons which intercepted the V1 flying bombs. This dangerous activity continued until the end of 1944 – although by October 1944 it was once more flying sweeps over the Low-Countries in support of advancing allied armies. The book describes the Squadron’s activities in 1944-1945 lucidly and with tempo – which almost makes the reader experience the 1945 disbandment personally ! The appendices make up two-thirds of the book. There is so much information crammed into these pages that perusal soon establishes that this volume is a “must buy” for any enthusiast or historian interested in the subject. Three pages present general information about the Squadron, the origin of the squadron crest is described – all commanders from 1937 to 1945 are named, with their periods of command. The total sorties flown on each a/c type – together with claims and losses per type are tabulated with the number and nationalities of all aircrew killed. The various commands beneath which 501 Squadron served are listed chronologically – with details of individual sectors. A page of matching aircraft serials with known individual code letters – for Hurricanes through to Tempests will be greeted by historian and modeller alike. Two pages present maps of the Unied Kingdom and Northern France – listing all airbases and airfields from which the squadron flew from 1929 through to 1945. The wartime ORB is compressed into seven pages – listing the 11,140 wartime sorties of 501 Squadron, by date with monthly sub-totals. Half a dozen pages list all claims, probable and confirmed – with details of pilot, a/c flown with serial and code and type of enemy a/c. The 115 a/c lost on ops are then listed by type with details of pilot, a/c serial/code letter and fate of pilot. The same attention is given to the 22 a/c lost through accidents. Two sombre pages present the Roll of Honour of all aircrew killed in action, with service number, country of origin and age. Seven known POWs are listed with details of where they were incarcerated. The final fifty-seven pages of this book are a treasure. In the Squadron Roster all aircrew (over 300) which flew with 501 Squadron are listed – with cameo biographies of their service lives, and fates (deaths) with photographs where available. It soon becomes apparent that the Squadron was truly international. Well known British pilots, such as Joseph Berry, “Ginger” Lacey and Christopher Currant have extended biographies. Better known Polish pilots include Stanisław Skalski, Stefan Witorzenc and Bronisław Malinowski. FFAF aircrew included Bernard Fuchs, Pierre Delange (KIA in 1944), Régis Deleuze and Jean Vaissier ; Belgians, Czechs, Canadians, New-Zealanders. Americans, South Africans all flew as members of 501 Squadron. This segment of the book will prove invaluable to both historians and enthusiasts. A postscript page provides key information about the post WW2 reformation of 501 Squadron within the Royal Auxiliary Air Force 1946 – 1957 and from 2001 up to the present time as an reserve RAF regiment unit. The book is well illustrated, presenting many interesting photographs as well as 9 splendid high-quality colour side profiles of selected aircraft flown. An interesting photograph on page 14 shows squadron personnel retreating (somewhere in France 1940) driving a French Army US-supplied “White” truck. Scattered throughout the book are block texts describing the main types & marks of aircraft flown as well as presenting serial numbers for each type as operated by the squadron.. This book is written in English – though it is published in France ; this reviewer must state that he is impressed with the quality and accuracy of the text. The day is still far away when a British or American author or publisher would undertake to produce a book concerning French aviation – written in French. The few ‘curiosities’ in the text merely serve to make the book more endearing. The two sentences commencing with “But” beneath a photograph on page 4 – will alone cause deceased English teachers to spin in their graves from Paris to London. The Prinz Eugen is described as a ‘light’ cruiser, and one wonders why a ‘distillery’ should have been attacked by the squadron on 18th February 1942 rather than perhaps a refinery ? The title “Breakdown of pilots killed by citizenship” has all the right words but in the wrong order. The reviewer would have welcomed an index. It takes a few readings of the book to get a feel of where everything can be found – an index would have saved time. No. 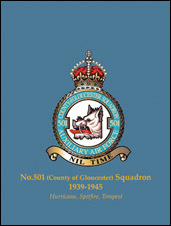 501 (County of Gloucester) Squadron 1939-1945 is highly recommended by this reviewer ; for those interested in 501 Squadron specifically or RAF fighter squadrons generally. There can be no expert on the subject who is such an expert to already know all the information it contains and there is no enthusiast who can really afford to do without it.